Whilst the manager has been doubted by taking over ‘easy’ jobs in the super-teams of Bayern and Barcelona, Pep will have no such luck in Manchester as the team he has inherited showed key tactical flaws under Pellegrini. The Catalan coach has a big challenge in getting the team up to his standards and in this article, I’ll be looking at the tasks facing him and how he has already begun to amend the system. 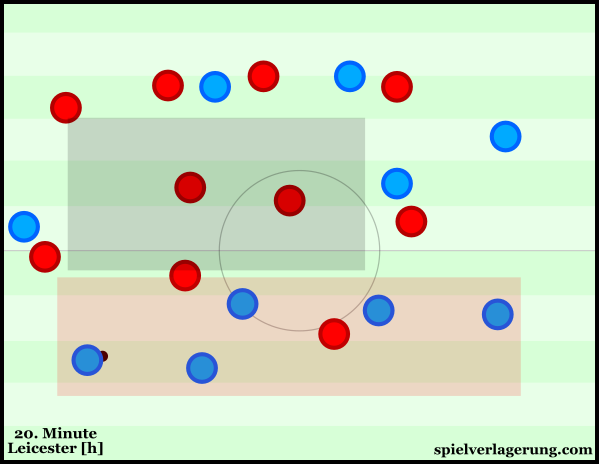 As noted well on Spielverlagerung, positional play is perhaps the number one factor in the success and beautiful football of a typical Guardiola team. Both his Barcelona and Bayern sides were trained to be positionally intelligent and would consistently occupy the correct spaces on the pitch at all times, in turn allowing them to move the ball quickly and emphasise the abilities of players such as Messi and Müller. 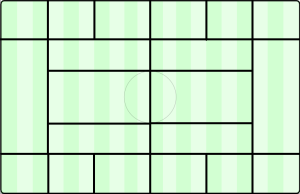 His sides practice on a marked pitch which consists of 4 vertical lines which separates the pitch into 5 vertical corridors of space as he teaches them to position themselves upon the lines marked below. The marked pitch which Pep coaches his team’s positional play on. This grid acts as a guideline for his players’ positioning and they are taught to orient themselves on this grid in different ways depending on the ball position. The position of the ball is a primary reference point whilst the grid itself gives them a reference point on how to position themselves according to the different situations. If followed correctly, these guidelines can help a team achieve a strong level of spacing with appropriate distances between players conducive to near-optimal ball circulation. If not following a scheme, it is possible that a team’s structuring can become harmful to their possession game. A good example is the free-form nature of Arsenal, where the players’ poor understanding of how to create appropriate attacking shapes reduces their ability to move the ball with fluidity and penetration. Often relying on the individual quality of players such as Özil and Ramsey, their poor spacing is one of the greatest limiting factors on their play with the ball. Obviously it’s possible to have a good structure without a set scheme but in City’s case, a positional guideline might be just what is needed for them to get the most out of the likes of Agüero and Silva. Given that spacing is a key element of Pep’s ideology, it will be interesting to see how he approaches a Manchester City side who struggle to create appropriate shapes as a team. Players rarely achieve many of the intentions of positional play as they fail to occupy and support the key spaces around the ball-carrier, nor shift accordingly when re-adjustment to the ball position is required. It’s extremely difficult to progress the ball with no player connecting the attack vertically. This is highly problematic in nearly all phases of their possession. During the build-up there are only few midfielders who actively look to make themselves progressive passing options whilst the likes of Yaya Touré and Fernando are particularly passive. Neither consistently take up positions which can help their team in moving the ball forwards and the build-up stagnates rather regularly. Without a means of moving the ball past the oppositional press, they also become quite susceptible to the pressure which can in turn cause some dangerous situations for the Manchester team. These moments are common throughout City’s matches and it significantly stunts their attempts at passing the ball out of the back. Without players in these key central areas, they reduce their ability to move the ball forward and invite the opposition to put them under pressure whilst they’re in a weak position. If there aren’t any midfielders or forwards in important positions, then the risk to consider when pressing is much less as the consequences are smaller in the chance that the pressing is bypassed. Four players within touching-distance and just one in the midfield block. City’s incapacity to space themselves correctly has often led to an inability to penetrate the attacking midfield area, or ’10 space’. When trying to circulate the ball through the midfield, they often have an insufficient amount of players behind the opposition midfield as many are more inclined to occupy inoffensive positions in deeper spaces. With few players to move the ball forwards into, their ability to penetrate lines of defenders is significantly reduced which leads to a slow and ‘U’-shaped ball circulation which is easily defended against. In the same play as the graphic below, they demonstrated the limiting power a weak positional structure has within the final third. With literally no players occupying the central column of space, it is nearly impossible for City to fashion out a chance of any quality. There are no players to pass to in dangerous positions and the side are forced to pass the ball backwards. The strange 4-chain in the deepest line is completely unnecessary too, as it simply means that there are less players further upfield to occupy more progressive positions. Although Leicester’s counter-attacks are very dangerous, having 4 players in the deepest line is inappropriate for the situation, when the occupation of the midfield spaces is so insufficient. Weak spacing in the final third means little way to penetrate the 10 space. City’s inability to occupy the key areas of the pitch and distance themselves appropriately restricts them from achieving an important facet of juego de posicion – positional superiority. By occupying different lines on the pitch and staggering effectively, a team can create space and passing lanes within the opponent’s defensive block. Yet just as in the examples provided above, City are unable to create such gaps or lanes and there is no pressure on the defensive stability of the opposition. For an in-depth look into Guardiola’s juego de posición playing style, read AO’s detailed analysis of the philosophy. Another one of City’s tactical issues on the pitch is their reaction to losing possession of the ball. Not only is there a distinct lack of pressure once a turnover is made, but open gaps are plentiful in the midfield which allowed teams such as Leicester to cut through them last season. This issue predominantly stems from their weak spacing when in possession. If the players are disconnected and distributed poorly when they have the ball, then the same factors are going to impact their attempts at counterpressing. Should they make a turnover with few players nearby, it becomes rather difficult to enforce a sufficient level of pressure and the opposition can counter-attack with relative ease. It becomes difficult to form a strong counterpress from a weak positional structure. With a poor attacking shape, City are now exposed on the break. If there aren’t many players in spaces around the ball, then there won’t be any defensive presence if the opposition regain it. Another thing to consider is the actual positions of the players; if they’re grouped together with too-short distances then it’s likely that other spaces will be uncovered. In the case that the opposition defender intercepts the ball, there will be open spaces to move the ball into and away from pressure of any counterpressing forwards. Because of City’s weak positional game with the ball, their transition into defence is very weak and they cannot effectively counterpress nor can they recover well due to the open gaps left in the midfield. A clear example of this is to the left. City have tried to attack but their weak shape was a contributing factor as they lost the ball in a turnover. With Arsenal now on the counter, City’s control of the midfield is poor with open gaps through the centre – the large distances between the players means that the highlighted CM has too much space to cover and is easily beaten. Another key factor in this tactical deficiency lies within the players. In moments where City turn the ball over there is a lethargic nature about the reactions of some players and they’re slow to either press or make a recovery run. This obviously makes transitioning into defence much more prone to counter-attacks with there commonly being an under-manned counterpress or an absence of recovery runs being made. Without the midfielders getting back into a stronger defensive position, the spaces open at the start of the break take a long time to close thus giving the opposition a greater opportunity to establish a dangerous attack. Considering that this issue was more prevalent towards the end of the season and is somewhat a question of effort, it could well largely be a motivational problem which can commonly be corrected with the introduction of a new manager and backroom staff. There is little doubt that Pep will improve the defensive transitioning at the Etihad and this can largely be done indirectly. By improving the spacing through the above-mentioned adaptions, Guardiola will give his team a much stronger starting position from which to counterpress. With a better connected shape with stronger numbers around the ball, City will theoretically be able to quickly apply pressure with numerous players and from various angles in close vicinity to the opposition ball-carrier. Although counterpressing is conceptually consistent as the act of pressing the opposition upon losing possession of the ball (i.e. pressing the counter), there are multiple ways of doing so. As for the type of counterpressing we can expect to see next year at City, the Catalan coach implemented one based around the passing lanes in his native country. Upon losing possession of the ball, the players will prime themselves to anticipate the first pass by the opposition and look to intercept it in the passing lanes. Guardiola’s passing-lane oriented counterpressing at Barcelona. To read more about the concept of counterpressing, find RM’s excellent tactical theory article. City also have some fairly clear issues when pressing in non-transitional moments too. They often find it difficult to effectively close down opponents and are particularly open when they do so, with sizeable distances between players. It is rare to see the midfield push up sufficiently behind the two forwards and the spaces in which a defensive or attacking midfielder would be can become exposed. Despite being aggressive and on the ‘front foot’ in defence, City don’t seem to prioritise covering the key spaces in the centre of the pitch. Compactness in pressing is an issue shared by many in the Premier League. Their midfield is particularly open during these moments with the two 8s having large amounts of space to individually cover whilst the likes of Touré simply aren’t dynamic enough in defence to do so. The defensive line is rarely high enough to close the space behind the midfield whilst the midfield themselves struggle to reach positions where they could effectively support the front two. This is a common problem shared by numerous teams in the Premier League. Although this area is due to improve with the introduction of managers such as Klopp, Conte and Guardiola himself, many teams are still unable to maintain compactness in defence. Such characteristics are key factors in what makes the league be considered as one of the entertaining in the world – open matches with strong individual attackers. It’s been a thorn in Manchester City’s side for years, being particularly problematic when they come to face the best in Europe in their failed Champions League runs. Coming up against teams such as Barcelona who can create better co-ordinated attacks as a group, City are given less lee-way in their disconnected defence. Because they face Premier League teams where the majority of which struggle to formulate cohesive attacks as a group, compactness isn’t as much of an issue as it would be in the Bundesliga or La Liga. Due to this open shape, City can often struggle to form effective pressure on the opposing team. The large gaps available to the opposition offer a way out of any tricky situations which makes defensive access difficult to create. If you pair this with the at-times passive defending of the front two, then City’s defensive structure is rather unstable and lacks security in the centre. Without pressure on the opposition’s first line, they have more time and space to pick out a pass into the open defensive block. When the forwards do look to apply pressure, it can be quite difficult to make it a threat to the opponent’s build-up. Not only is there extra space for the opposition to evade the pressure into, but there is a distinct lack of support from the midfield four. 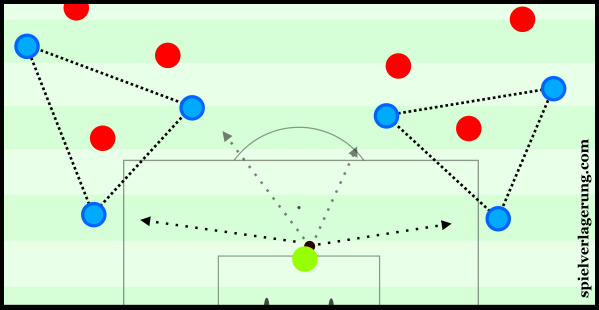 Although the ball-near winger will push up to (individually) press wide situations, they chain of four is commonly disconnected from the front two. This uncompact shape makes it difficult for inter-player support in the pressing which results in quite an individualistic defensive effort. In such scenes it’s difficult for the central midfielders to properly support the forwards. The most common example is perhaps found between the central midfielders and the strikers. Because of Touré and Fernandinho’s deep positioning, they are often disconnected from their teammates higher up. Because of this, there are spaces in between which can be capitalised on by the opposition. If Agüero, for example, is beaten then you’re unlikely to see a City midfielder closely behind him to cover; instead, they are positioned deeper and the uncoordinated press is broken and exposed with ease. Direct play is easier to make against an uncompact press. By pressing with an open and stretched shape, one allows the opposition to benefit more from a direct passing game. Long balls are commonly used as a means to counter a pressing defensive system as it acts as a means to bypass the pressure higher up. By having an uncompact midfield, the players higher in attack have more space in which they can receive the ball, whilst the forwards are more able to lay-off any long passes to continue to the attack. As you can see on the right, City have looked to close down WBA in build-up with Agüero the closest person to McAuley in possession. Whilst the front four are in advanced positions high up the pitch, the two central midfielders are much deeper and thus a significant opens up in the centre. The long ball is played into Rondón who is able to make an unchallenged lay-off into said gap as WBA continue their attack forward. 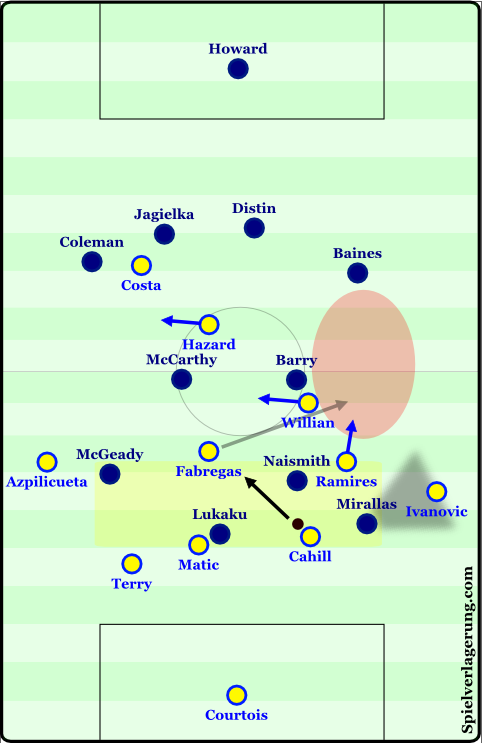 The above-mentioned disconnect is also evident in this play, with neither central midfielder in any position to support the press. As a result, the closing down was ineffective and although WBA opted for the direct option, McAuley could’ve easily played the ball on the ground into the vacated space highlighted. Upon moving the ball into the opposition half, a team would ideally be moving within their shape to open up spaces within the midfield to make the next progression. Yet City, holding numerous attacking talents, are instead distinctly static off of the ball with a clear lack of supporting runs being made from the midfield players. In an almost lethargic manner, players such as Yaya Toure and Fernando operate in very small spaces and rarely break sweat in trying to offer connections to the ball. Although their attack can have a somewhat free-form nature, the level of dynamism in the shape is definitely sub-par. This plays straight into the hands of the numerous man-marking Premier League defences. When the opposition players are static and without movement, it instantly becomes much easier to cover them through man-marking. Not only do City miss out an opportunity to destabilise and disorient their opposition through off-the-ball movement but individually they become easier to defend against. Without the movement of teammates, City show evident struggles in the task of opening space in midfield with players unwilling to move in order to create the gaps which are so key in generating dangerous attacks. Without a sufficient level of supporting movements in the midfield, City’s attacks can soon become isolated within the play. As the ball-carrier struggles to find nearby players moving into helping positions, he can be isolated fairly easily and the capacity for them to work in a team is restricted. This is particularly the case in wide areas, where not only does the ball-carrier have less space, but his teammates aren’t willing to shift quickly to support him through the necessary connections. The movement of the deeper midfielders is one of the bigger factors in this lack of dynamic and all but Fernandinho are to blame at least to some extent. Whilst the likes of Toure are rather lethargic, Fernandinho offers an individual dynamism which can be quite useful when moving the ball in midfield. The versatile midfielder covers a relatively large amount of space, allowing him to be present in the circulation which he does so with clever short passes within the midfield gaps. At times he is the only one offering connections to under-pressure teammates whilst Fernando is in contrast much less ball-oriented in his positioning on the pitch. Although his presence is important to City, he obviously can’t fulfil the role of 3 players at the same time (after all, he’s no Luka Modric) and his team are still lacking in this department. Aguero has possession on the right touchline, yet none of his teammates adjust their positioning to support. The responsibility of creating this pace and dynamic in the attack is often dropped on one player – David Silva. With the rest of the team in stagnation, the diminutive interior often takes it upon himself to accelerate the attack as he comes to receive the ball and proceeds to carry it into more prosperous situations. Obviously, a reliance on one player is far from ideal and although many Premier League defences are bettered by this strategy, it’s less sustainable against stronger opposition. Looking past this lone player, City can sometimes prosper through the dynamic between small pairings of players, such as the Silva – Zabaleta tandem on the right of the pitch. The 4-4-2 shape under Pellegrini allowed for a number of small partnerships to form which gave City some threat in the final third through the synergy between these pairings. However the fact that these were restricted to just 2 or at-times 3 players meant that any attacking strategy based around these few attackers was of limited potential. Without the aforementioned penetration, City’s ‘U-shaped’ circulation is a factor in this problem too. The ball’s side-to-side movement is very rarely met by the appropriate adjustments in positioning off of the ball. For example, if the ball moves from the centre to the right-wing, then it is almost-necessary for the midfielders to create passing options around the right half-space. Yet many of the players are reluctant to do so and stay centrally instead, offering no connection or support to the ball which has just entered a strategically-weak position. 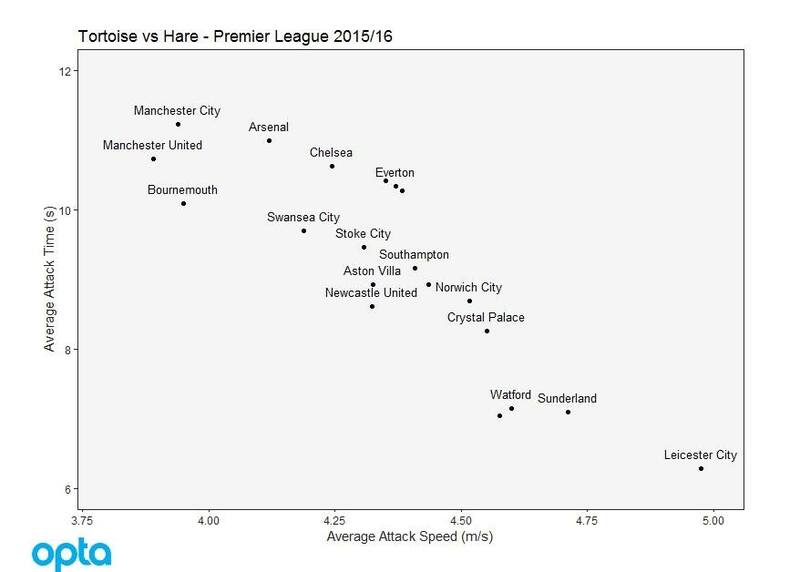 When taking this into consideration, it comes as little surprise that Manchester City possess one of the slowest attacks in the league. They gain space at a very slow rate as they progress up the pitch with little intensity and despite receiving a fraction of the criticism, are comparable to their Manchester neighbours. With the players taking their time in moving off of the ball and supporting the ball-carrier, it not only takes time to formulate an attack but also progress it through the lines of opposition defence. This issue is something which Pep will need to address early and has already began doing so. The excellent signing of Ilkay Gündogan introduces another dynamic player to the squad and is one who carries the ball well with high game intelligence. With spacing being such an important facet of Guardiola’s playing philosophy, improving their movements off of the ball will be high on his list of priorities. Gündogan represents many things which players such as Yaya Toure are not and through both training and squad re-structuring, City will be soon on the path to improvement. Within the above-mentioned juego de posicion, various supporting movements are trained in order to create strong support in the ball-local spaces whilst crucially maintaining positional balance and stability. There were many examples of this during his time at Bayern Munich. If a winger such as Kinglsey Coman receives the ball on the touchline and looks to move inside, Phillip Lahm will balance this movement by moving from the interior line to the touchline and effectively rotate with his teammate. In order to provide from balance and security to this movement, a central midfielder may shift simultaneously to occupy the spaces behind the two wide players. These supporting movements are executed to enable the team to maintain positional balance whilst constantly adjusting to sustain support to the ball-carrier and the spaces around him. If they aren’t made, then the side would quickly lose key support to the ball and circulation may be less effective and stable. In the first example, Lahm maintains the balance by re-occupying the touchline whilst potentially creating space for Coman inside or even offer for an overlapping run. The central midfielder increases the security of the possession by taking up the space behind them which can be useful for counterpressing situations and if it becomes necessary to ‘reset’ the play. Improving their attacking in the final third will be a major key if Pep wants this team to become as potent as what he created at Bayern. City have some talented individuals such as David Silva and Sergio Agüero but in recent years they have struggled to work well as a collective. The lack of supporting off-the-ball movements highlights an attack which is quite individualistic at times with players struggling to incorporate teammates into the play. Despite their clear structural issues, this aspect is often overlooked as they’re able to attack frequently due to the individual quality of their players. Especially in the Premier League, they can rely on individuals such as Silva, de Bruyne and Agüero to create chances despite not effectively coordinating attacks as a team. However, because of the lack of connections between players, it still acts as a limiting factor in the potential of such forwards and a positional structure more conducive to team-play would provide a better platform for these players to perform to their abilities. This is a stark contrast to the football we saw at Bayern with many players working together to create dangerous situations within the final third. Players would stay connected for the duration of the play by moving well and positioning themselves effectively without the ball which allowed them to participate in combinations when they try to break through the defence. Another means of generating superiority is through overloads (named numerical superiority) where the attacking team positions more players than their opponents in a particular space – in doing so, they create free players who can be uncovered in space to accelerate the attack forwards. This tactic represents a truly collectivist playing style where teammates work together to create a promising situation as a group, A goal which Pep will aim for his City team to achieve. In order to demonstrate their lack of dynamism, I went over the Real Madrid semi-finals and clipped their possessions where little movement off of the ball was to be seen. Whilst Manchester City’s problems are rather deep-rooted in their play both in and out of possession, we may see a rather fast turnaround in performances this season. We saw an incredibly quick improvement in Dortmund after Thomas Tuchel took over from Jürgen Klopp on the back of a terrible final season for the now-Liverpool manager. It was known that Tuchel had met Guardiola on a number of occasions during his sabbatical and when he arrived at the Westfalenstadion, the coach implemented a playing style which closely resembled Juego de Posición. A scene from Tuchel’s first Bundesliga match in charge of Dortmund. As I documented in my Hinrunde analysis, Dortmund’s excellent performances saw a rapid return to one of the best clubs in the world. The now-more possession-based footballing style had Tuchel get the best out of world class players such as Henrikh Mkhitaryan, Mats Hummels and the man which Pep now has at City, Ilkay Gundogan. 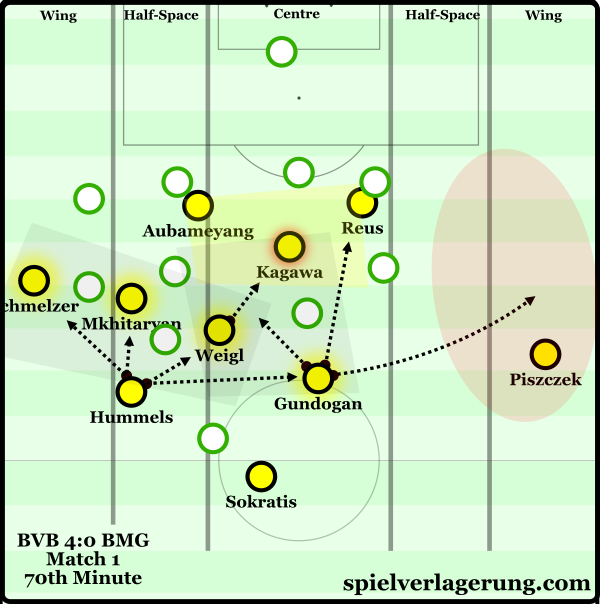 From their 4-o win over Gladbach on the opening matchday, Dortmund’s spacing was at a very high standard and with it, other aspects such as their ball circulation and counterpressing improved dramatically too. It is highly possible that the guidelines for positioning and other rules which come with this playing philosophy allow players to understand the system better. If a player knows there are 2-3 positions he should be taking up when the ball is in x area, then it’s possible that he can understand his role faster as opposed to a style which demands a less-rigid interpretation on the pitch. Dortmund made an excellent start under Tuchel. However, Guardiola’s playing philosophy differs from Tuchel’s in some ways. With the Man City boss, the guidelines for positioning are more explicit and rigid whilst the circulation of the ball is more patterned and structured than what we saw over the past season in Dortmund. Because of this, we may see a different speed of adaption from the City players. On one hand, the more explicit playing style may allow the players to execute it sooner on the pitch, yet due to the more regulations in the playing style, it could take longer for the likes of Sterling and Silva to learn the ropes of Guardiola’s footballing style. Another factor is the quality of players. Whilst Dortmund possessed many intelligent players such as Weigl, Kagawa, Schmelzer, Hummels and not least Mkhitaryan, City don’t possess a similar level of squad. Although the likes of De Bruyne and Silva have impressive tactical intelligence, the same cannot be said for players such as Fernando, whilst Raheem Sterling is lacking in this area too. At Dortmund, Tuchel had players such as the team-tactical genius Mkhitaryan who learned the system immediately and Pep may not have the same luck in Manchester. Although we have only been fortunate to see glimpses of City in pre-season, there have been many promising signs to be found on the training pitch. A basic rondo seen in a training session at the new ‘Etihad Campus’. No-one will have been surprised to see nearly every exercise involves a football to some extent, the warm-ups feature basic manouevres in passing and very rarely can you see work without the ball. Every aspect is football-specific and more specifically focused on improving technical capacities and manipulation of the ball – something obviously central to Guardiola’s footballing ideology. It didn’t take long for rondos to make an appearance either, with some basic variations being used to help the players adapt to the new playing style. Rondos are an incredibly useful tool to have in training as they are a rather holistic exercise which trains a number of key footballing aspects, especially for the simplicity of the drill. It’s clear to see their use in helping players improve in their combinative ability and capacity to pass cleanly in pressured situations. Moving past that however, it’s an important practice to develop things such as body shape in receiving passes, the use of different parts of the foot in controlling and passing the ball as well as passing through defenders and making the most out of numerical superiority. The defensive side of rondos is quite commonly overlooked, as it helps the defenders improving their pressing mechanisms and anticipatory capacity as they try to overcome the clear numerical disadvantage. Guardiola has had the ‘keepers acting in the rondos – every player needs to be technically proficient. It seems like Guardiola took little time to begin to address the issue of spacing in possession, with his first training session showing him directing players’ positioning during build-up. From what the club’s YouTube channel allowed us to see, Pep designed a match-like scenario where they focused on the structure of the team when playing out from the back. In an obviously laid-back session, one team would build-up possession from the goalkeeper, often passing in clear patterns through the players and upon reaching the half-way line, would pass it to the opposing ‘keeper and the sides swapped roles. The defenders split in deep positions whilst a pivot would drop between and the player’s positioning off of the ball took the main focus of the session. 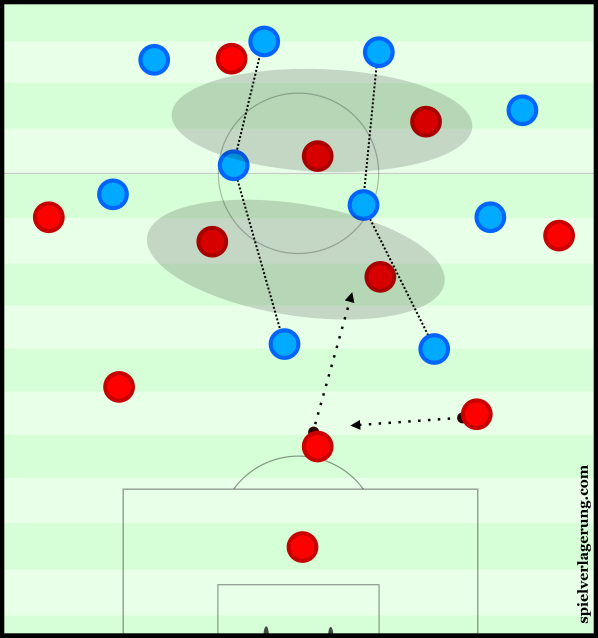 Pep would sometimes specify the focus and force the teams to build-up through exact areas on the pitch, as h In other areas, it seemed there was a focus on ball-oriented shifts which had the purpose of re-adjusting and maintaining support in areas around the ball despite longer passes being made. 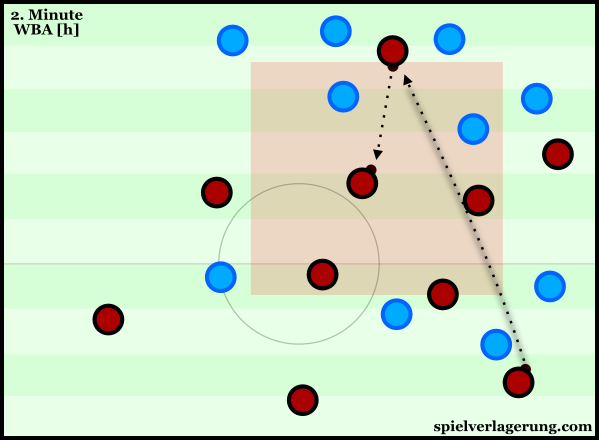 A simple 6v6+3 exercise was part of a session in Säbener Straße. There have been signs of further work on this area in a short clip of another exercise. In a fairly small square area, a (possibly) 7v7+2 game was played where the focus was on maintaining possession and using the joker players to create connections and overloads to keep control over the ball. Another session shows a similar 6v6+3 practice with the same principles as the former, later on in the session – this was elaborated into a small match spanning the length of one half of the pitch. The emphasis remained on active positioning off of the ball and the players maintained a fairly good level of connections as fast combination plays ensued as a result. It has been interesting to see Guardiola give quite explicit instructions to his team during training, especially when they’re learning the basic positioning in match situations. The coach clearly states the positions which he wants them to be in, instead of allowing them to find their own solutions. The most likely explanation for this is to do with time. Pep himself stated that he doesn’t have a lot of time due to the nature and short-sightedness of the league so he needs his team to understand his ideologies quickly. Through telling them exactly which positions they should take up, Guardiola can quickly establish an understanding with his players and as a result, they can move to understand other concepts. If he were to use a more implicit approach, then it may take longer for the players to grasp a basic understanding of this principle as the players have to find the solutions themselves. With all the work put into their positional game on the training pitch, it’s clear that Pep has already made his mark on the team and they’ve showed exactly that in friendly matches. In their first match at the Allianz Arena, City showed many signs of a typical Guardiola-team with many changes clear from the system which Pellegrini departed with. You could see this micro-structure when City were practicing their build-up at the Etihad Complex. During their build-up of possession, both centre-backs dropped to either side of the goalkeeper whilst Fernando and Fernandinho would drop into receiving positions too. The full-backs would occupy slightly higher positions and triangular structures were thus created within the half-space and wings. Such patterns trace back to the work on the training ground which I previously referenced as they practiced their build-up structure on the very first day – the centre-backs stayed wide of the ‘keeper, the full-backs moved higher whilst the central midfielders offered on the edge of the penalty area. They passed the ball more efficiently and had a clear direction in their circulation. 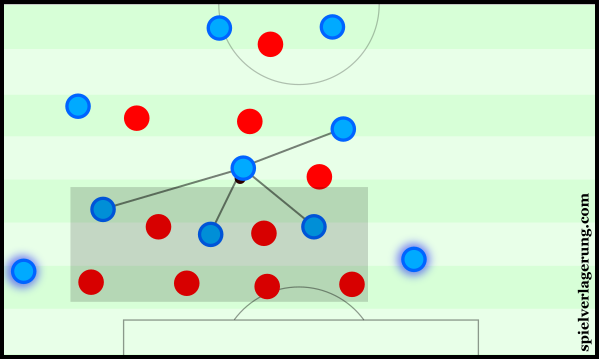 Often inviting Bayern further up the pitch during the City build-up, they had the intention of passing the ball into any space created from their press. Such a concept is a typical feature of both Bayern and Barça under Pep and is an aspect of Juego de Posicion. By inviting the opposition to press, it often forces them to vacate space in other areas which can then be used to progress the ball upfield by the team in possession. A large aspect of Guardiola’s playing philosophy is centred around creating a free man within the opposition block and drawing them out helps his team achieve this. It’s also one of the reasons why he demands such ball-playing capabilities from his deeper players – they need to be comfortable against pressure from the opposition forwards. Less positive things could be said about their build-up in the match against Borussia Dortmund. Tuchel’s side pressed aggressively throughout the game and City rarely looked comfortable on the ball as they made many turnovers within their own third. The level of support in connections from midfield was commonly insufficient and Caballero’s inability to pass accurately had him resorting to aimless long balls. A moment from the 40th minute. Whilst their possession game did show clear improvements and distinct traits of a Guardiola side, they still showed the remnants of last year’s side, which is entirely understandable of course. While evidently improved, their spacing was rather inconsistent and the lower-level of synergy common in pre-season (and under a new coach) was unmistakeable as the distances between players wasn’t always conducive to effective ball circulation. City’s inability to maintain a sufficient level of occupation over the attacking midfield spaces was once again on display as their positional structure in the final third at times resembled a clear ‘U’. However whilst it was a big problem in these isolated moments, it was much less a recurring issue throughout the 90 minutes. The midfield and forwards were able to more persistently take up positions within the Bayern defence and although the staggering of the players was sub-optimal, it’s a definite improvement from what we would have seen a few months prior. Although the structure isn’t ideal for strong attacks, it’s an improvement from last year. Improvements have been made from a defensive perspective, too. Guardiola’s new side are making a shift into a more zonally-marking system as the players maintain their defensive structure better out of possession. Although individually, some players such as Fernando are still showing a tendency to follow their man off of the ball, City’s new zonal-focus sees them maintain a higher level of compactness and stability. Against Borussia Dortmund, the pressing of City looked strong as they were able to stop the opposition from consistently constructing possession with short passes. Although a quickly-deteriorating pitch supported their cause considerably, Pep’s team were able to put the ball under pressure well and force more direct passes from Dortmund. 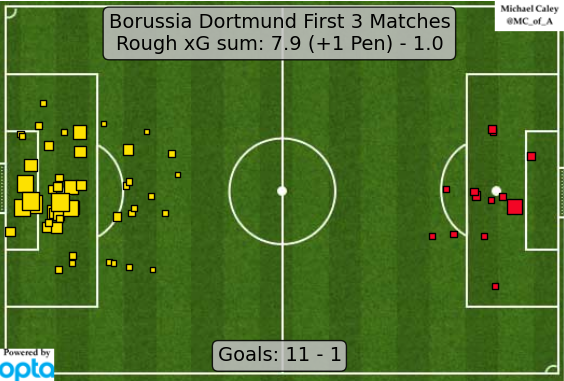 They were much more man-oriented in their attempts to press and when closing down Dortmund would largely man-mark in the BVB third. Defending in the 3-4-2-1 shape which Pep had chosen for the match, Zinchenko joined Iheanacho on the first line whilst Fabian Delph dropped into the midfield to create more of a 3-5-2 structure. This allowed City to match up man-for-man against Dortmund who were playing in a more orthodox 4-3-3 structure. City often lost their shape throughout the game due to the reactionary nature of their man-marking approach, but were able to effectively apply pressure for large periods of the match. It’s little secret that Dortmund are particularly susceptible when trying to build-up against such pressure and, especially without the structure-creating and pressing-resistant presence of Julian Weigl, their Manchester opposition posed a distinct challenge. City’s man-oriented pressing against Dortmund. Manchester City have been one of the biggest players in the summer transfer window, making a number of high-profile signings in order to strengthen midfield and wing positions. The biggest move of their window was the introduction of Ilkay Gündogan from Borussia Dortmund. Enjoying one of his best seasons ever, and certainly his best performances since the 2012/2013 season, the midfield benefited massively from the system introduced by Thomas Tuchel. Playing on the right side of the pivot in a 4-2-3-1, Gündogan was a crucial component of the system acting as an important playmaking influence in all areas of the pitch. The Turk-German is of great technical ability and one of the best in his position at carrying the ball forward through the centre of the pitch. In his position alongside Julian Weigl, Gündogan has a dribbling ability which few players have in this area of the pitch, allowing him to create space individually and avoid the pressing efforts of those who attempt to challenge him. His other great quality is his excellent capacity to circulate the ball and create chances for teammates. The 20-some million pound signing is capable of a wide array of passes, ranging from short interplay passes to far-reaching long balls with a particularly impressive chip over the top of the defence, as seen below. Fitting into Guardiola’s system at Manchester City, one can be fairly sure of seeing him largely in the 8 position in Pep’s preferred 4-3-3 formation. It wouldn’t be surprising to see a fast transition into Guardiola’s system considering his excellence under Tuchel in his last year at Dortmund. As I’ve already noted in this article, the two share very similar playing styles and principles meaning Gündogan will be already at least somewhat accustomed to such a game model and adjustment will be less drastic than the teammates he is joining. The second import from Germany comes in the form of young winger Leroy Sané. Signing from Dortmund rivals Schalke, the winger is thought to be one of the biggest prospects out of Germany football and for good reason. Playing largely on the right flank, Sané has a distinct inclination to come inside where he can use his dominant left foot (which possesses a rather threatening long shot) to greater effect and play with teammates or threaten with direct runs. His pace is a major tool in his array of skills and if necessary he can rely on this to beat his man either on or off of the ball. His playing style is far from a typical winger however and he also has a strong capacity to combine well with teammates either opting for simple 1-2s in wide areas or, towards the centre, more complex combinations. Coming inside onto his left foot, Sané shows quite a high attacking intelligence and is able to find free teammates with short passes or find runners with diagonal through-balls from the right half-space. Sané’s output isn’t limited to the offence either, as he can protect his full-back fairly well out of possession. Using his pace to cover a fairly large amount of space and can be a threat in backwards-pressing when the situation arrises. He will be challenged quite closely for a starting role on the wings, coming into a squad already possessing Sterling, Navas, Nolito and potentially De Bruyne, Silva, Zinchenko and Nasri. However it would be no surprise to see him quickly establish himself as the top winger against his competition, with the potential to be a valuable member of Guardiola’s City. Considering the ageing squad profile of Manchester City, the signing of Nolito came as somewhat of a surprise. Aged 29, he joins the likes of David Silva, Samir Nasri and Jesus Navas who are at the latter end, or past, the natural peak for their position. On this basis, it seems quite a short-sighted signing from Manchester City, especially considering it was confirmed before the transfers of Sané (20) and Zinchenko (19). The one redeeming factor however, is that the forward has a fairly low mileage in terms of matches throughout his career, having (according to TransferMarkt) only played 228 professional games. Compare this to the much higher mileage of Jesus Navas (over double at 538 matches) and the difference is striking, suggesting that Nolito could be closer to his peak and more useful over the next few years. Despite his low mileage, the signing of Nolito is still highly questionable. The winger is much more of a typical winger/inside forward in comparison to Sané which a much less dynamic playing style. His team-tactical intelligence is rather dubious and he struggles to make effective attacks between teammates with a poor capacity to make clean combinations. The £15m signing from Celta Vigo seems to have quite poor decision making on the ball, with a poor understanding of when to release the pass, especially in deeper situations where he simply looks out-of-place. More promising is the cheap signing of Oleksandr Zinchenko who arrived for just £1.7m from FC Ufa of Russia. The young midfielder played mostly on the right side of his old club’s midfield but is more-than capable in an attacking midfield position, as he showed in City’s friendly with Borussia Dortmund. More of a team-player than Nolito, the Ukranian 19-year-old’s playing style is somewhat focused around short passing combinations with teammates and bringing others into play. With the depth which City possess in the attacking-midfield positions, it’s unlikely that we will see a lot of Zinchenko this season as he may be a 3rd back-up for large periods of the season. However it seems an intelligent signing considering his age and price tag, whilst his playing style could suit Pep’s football quite well. The latest major signing from Manchester City has been the Brazilian Gabriel Jesus from Palmeiras. At a striking £27m transfer fee, the 19-year-old is much of a high-profile transfer than that of Zinchenko yet he will remain at his Brazilian side until December though you’ll see him before then for Brazil’s olympic squad. Adding even more competition to the winger positions, Gabriel has the capacity to play more centrally too but we’re more likely to see him act in wider positions unless Pep has a secret plan for the young forward. In his most recent matches for Palmeiras, he’s acted as a lone striker in a 4-2-3-1 or 4-1-4-1 which suggests a capacity to act as back-up to the striker position at City. Whilst Guardiola has already improved his new side to some extent in his first few weeks at the club, it wouldn’t be surprising to see him look towards the transfer market to finalise his squad. Ilkay Gündogan could prove to be one of the best players in the Premier League but an additional reinforcement in midfield may be necessary at the pivot spot. Considering both Guardiola’s playing style and the squad at his disposal, Pep could benefit massively from a more team-tactically intelligent defensive midfielder who could be an important linking factor in the system. In Catalonia, the coach had arguably the best defensive midfielder of all time at his disposal whilst in Munich he had Xabi Alonso – who made a good contribution despite having some problems with his positioning. At Manchester City, Pep currently will have to choose from the likes of Fernando, Toure and Fernandinho (outside of new signings) for this defensive midfield position and only the latter suits his needs at this spot (and in that case it is still not a good fit). The Manchester club were linked with Julian Weigl earlier in the summer and the extremely intelligent Dortmund pivot would’ve been ideal to co-ordinate City’s build-up and ball circulation under Pep. In a somewhat similar system at Dortmund, the defensive midfielder constantly creates triangles and connections within the structure and connects the build-up to the midfield and attack. Leandro Paredes was another touted earlier in the season and the Roma 10-turned-pivot would be another well-suited for Pep’s idea of playing football. Unfortunately for the City manager however, Spalletti seems to have big plans for the midfielder after his return from Empoli where he made his mark as one of the best young players in Italy. With the possibility of David Silva and Kevin De Bruyne occupying the 8 positions in a 4-3-3, both Gundogan and Fernandinho come available for the defensive midfield position. Pep has already stated his appreciation for Fernandinho’s versatility, saying he could play in all 10 positions (though this is to be taken lightly) whilst Gündogan could be potentially capable of fulfilling this role too. Accompanying Julian Weigl in the deep midfield spaces last year, he played an important role during Dortmund’s build-up so it’s plausible to see him in a deeper role in Manchester. Another area in which we may see a purchase is in the goalkeeper position. Whilst Pep has both Joe Hart and Willy Caballero already, he may be on the look at for another goalkeeper – one with greater ability to pass the ball and help contribute to the side’s build-up. Neither Hart nor Caballero have the greatest of playmaking capacities and this could be somewhat harmful to their ability to make short build-up through the thirds. The Argentine ‘keeper started in the friendly against Bayern and his inability to play with the ball at his feet was evident. On a number of occasions, their opposition could easily force him into a difficult pass and they commonly regained possession from doing so. Whilst they have signed Geronimo Rulli, he will spend the coming season back on loan at Sociedad which leaves the goalkeeper spot for the first year still in question. Although both goalkeepers have taken part in the rondos and will have trained their technical abilities more intensely under Guardiola, there is a question around whether they are up to the level which Guardiola demands. With that being said, Victor Valdes had reluctancies upon the coach’s promotion to the Barcelona first team and we all know how that worked out. Particularly towards the end of last season, Manchester City’s tactical deficiencies were clear to see on the pitch as Pellegrini leaves Pep with quite a difficult situation in many ways. All three of the primary issues I stated above are things which play major roles in Guardiola’s playing philosophy and the manager will undoubtedly be looking to correct them with haste. Although Pep is one of the elite managers in the world, he may not achieve the high-quality performance he demands from his team straight away as a stark turnaround in numerous tactical aspects is required. Either way, the introduction of Guardiola at the Etihad is highly-anticipated and we will undoubtedly be following the coach closely as he makes his first steps into management on English soil. So in positional play the players position themselves on the lines or in the spaces between the 4 vertical lines?? They try to stay connected with each other while occupiing the relevant zones for their play. The lines are rough borders between different zones. Inside a zone there are special tasks and responsibilities for the occupiing player(s) to enable every player to play “everywhere”. There are a lot of principles in Juego de posicion like forming triangles and rhombuses (is that the right word?) to build as many player-to-player-connections as possible or not to position to many (e.g. more than 3) players on one direct line because they would block passinglanes between each other. By following these principles the Coach tries to create a free man inside the opponents defensive block. This man is the most dangerous thing because he gets a moment of time and space to make an potentially game-changing action. The free man can be everyone – thats not limited to attackers like Messi who often act as game-changers it could also be Mascherano playing a more precise pass because he has more time to elaborate his options and then picks the right one. Great article, this a great site and I know you guys have discussed positional play numerous times, but what would a players instructions look like. This site does a great job highlighting the theory such as, Half-spaces, Third Man, Counterpressing, dropping a midfielder in between the centerbacks,etc, but how does it get implemented practically. It seems very rigid, so I figured there be a list, even if out of date, of instructions. I think RM published an article about creating a game model in which he gives some examples on how actual instructions might look like. I don’t think there really is a “list” but coaches try to deliver their thoughts more implicit to their (sometimes not that intelligent) players. Players have their own ideas and are mostly acting out of instinct with little guidance from the coach (which spaces are important to the team, what overall style is played) and get special tasks for each game (pressing-triggers, etc.). Guardiola has a philosophy of playing with the ball and keeping dominance in important (central) zones. Therefore he wants his players to occupie spaces based on the position of the ball and their teammates. He tells his fullbacks wether to push up early and provide width higher up the pitch or stay closer to the centerbacks in buildup. Most of the spacing (thats the secret to his success) is learned in training through implicit methods (I think there is an article on that as well). For example he lets them play a 5vs2 where the 5 need to pass the ball through certain areas while the 2 try to intercept the passes. In-game his players will try to replicate such situations (small spaces, numerical superiority) and are able to use their learned “sense of distance” between each other to get their positions right. I’m by far no expert on this field so if anybody has more insight there feel free to correct me or add your point. I think you are right. The training exercises are set up to promote or improve a certain tactical behaviour (and avoid different behaviour). Of course the managers and coaches will talk with the players. But it often takes more time if players have to listen and think about what to do, instead of getting certain rules in training and just stick to this rules. Thomas Tuchel wanted to teach his players to avoid certain areas of the pitch during the build up of an attack, so he just ‘cut’ or reshaped the training pitch. He disallowed his players to use this spaces. Guardiola’s grid structured pitch is a similar approach. This (and many other) coaching methods help to adjust the behaviour of the players. That’s modern education. Instead of lecturing, players are directed (is this the right word?). But they have freedom in the framework created by the manager. The important instctions are not verbal, but training exercises. Don’t talk too much, do it. @tobit can’t reply to your comment so I’m hoping you see this. Ah, well at least there’s a couple of names to keep an eye on for the upcoming season! Plenty of stuff to broaden my football horizons, maybe the upcoming season will give me a different appreciation for Guardiola’s style. Just want to say thanks for all the helpful information as well! Excellent article. I don’t watch City much so I wasn’t aware of just how difficult the situation for Guardiola is this season. What do you think about his center-backs? He was gifted with technically aware center backs like Boateng and Pique in previous jobs, but how do City’s center-backs play into this whole system? I think a perfect defender like Boateng is not that neccessary in the Premier League because there won’t be real pressing to beat in most games. Otamendi always looked at least okay to me, he’s relatively quick and can play the ball without too many mistakes. The others are all quite flawed, either injured (Kompany) or pretty bad on the ball and/or far too slow. On the other hand he will need some strength at CB (thats where all of them are good) to throw against the bull-like PL-Strikers. He will look to bring in at least one playmaking CB (Stones, Laporte) but decent CMs should be more important (and more difficult) to acquire. Thats the part City lacks the most with only Gündogan and Silva really capable of steady ballprogression. Fernando and Yaya will be out pretty fast and might leave this summer, Fernandinho and Delph could be valuable squad players for certain situations but not for regular starting spots. Amazing preview! Thanks a lot. Am looking forward to the Citizens under Guardiola. Absolutely brilliant stuff, as per usual! I’m wondering though why Klopp’s positional game at Liverpool (and Dortmund) is not constructed in a similar way to how Pep sets up his teams. Surely Klopp would benefit from a similar positional structure when in possession to further bolster his teams counter-pressing abilities. Is there a reason he doesn’t do this? It was clear that Tuchel managed to turn Dortmund around with a similar approach. Also, is there a place I can find old games to rewatch? I want to take a look at some Bayern/Barca games under Pep to compare to Klopp at Dortmund and see the main differences. Juego de posicion requires time to build (on and off the pitch). You need to give your players time to acquire their “attacking-positions” while you build up patiently. Klopp wants his teams to attack open spaces after recovering the ball so the opponent has no time to adjust to a stable defensive formation. Also the counterpressing styles are pretty different. Klopp utilises the physical and mental speed of his team to close down the ballcarrier with multiple players. Therefore a perfect structure is not that neccessary because it can be corrected with great intensity/physical abilities. Guardiola e.g. tries to intercept passes to other opponents. To intercept passes effectively you need to be close (but not exactly in) the opponents passing lanes and be able to move into it quickly to catch the ball. The ballcarrier gets surrounded but doesn’t feel direct pressure so he might try to pass his team out of defense. There are often plenty of passing options that need to be covered so you need a strong structure to do so. Thank you for the reply, you’ve actually cleared an awful lot up for me there! The main difference then is simply the speed of build up play I guess, Klopp is more transitional and fast whilst Guardiola is more considered and slow. I do still feel that Klopp should learn to implement a better positional structure for games/situations when his teams are forced to build play from deep against passive teams as I feel this is his/his teams achilles heel. Unless he has his own methods for breaking down stubborn teams that I haven’t spotted? I really enjoy Klopp’s style against more aggressive or “better” sides as that is where his teams flourish but I get very frustrated watching them play against the other sides. He should definitely use some more (training)time on the offensive structure but it’s not his style to do so. He did that quite well in 2012/13 at Dortmund with the likes of Hummels, Götze and Gündogan at their best but went back to a more pressing focussed approach afterwards. He doesn’t have players of that quality at Liverpool so he needs to use what he has (strength, speed, endurance) to overrun his opponents. When playing against teams sitting very deep he often tried to create overloads or even seemed to advise his players to purposely loose the ball in hope of a counterpressing-situation. Most of the time Dortmund could also rely on the individual class of their attackers to break down defenses. I suppose that’s what separates Klopp from Guardiola then. Would a Positional Play approach even be possible with a more vertical passing game that Klopp and Bielsa employ? I’m almost certain the ball would move too fast for a structure to be in place, but I find that pace of play to be more enjoyable to watch compared to the suffocating possession of a Guardiola team. Paco Jemez (former Rayo now Granada coach) is the man you’re looking for. His teams are quite weak individually but sometimes are able to play a hilariously fast and entertaining version of juego de posicion. They often lose though due to frequent individual errors and at times risky pressing. Or if you are interested in a more successful site have a look at Sampaiolis Sevilla this season. They combine some of the best out of both Guardiola and Klopp/Bielsa but get unstable at times.